Disclosure: This post was sponsored by Walmart. Spring is finally here. Can you believe it? I’m loving the warmer days and the sunshine! Oh how I’ve missed the sunshine. With all of the beauty blooming outside, I can’t help but have spring cleaning fever. I’ve been busy indoor for weeks spring cleaning our house but as I looked outside I knew that the outside of our house is just as important for spring cleaning as the inside. As a part of the Walmart Moms, I was to tackle some projects off of my outdoor list using products that can be found at Walmart. At the top of my outdoor project list was to spruce up our front porch. This is the area of our home that is first seen when guests arrive at our home and honestly it was looking pretty sad. Not a very warm, and inviting space at all. I gathered some items from around my home that I wanted to re-purpose for this space as well as visited my local Walmart to find additional items I needed to complete the space. First on the list was to revive an old iron table and chairs that had been hanging out in our backyard for many seasons. The paint was starting to chip away and small bits of rust were starting to show. This table and chair had seen its fair share of outdoor weather and it was definitely starting to show. I knew it needed a new coat of paint. I picked up several cans of Krylon Cover Maxx Ultimate Coverage ($3.67) at Walmart. This spray paint is specifically designed with rust protection which I knew I needed when re-painting my iron outdoor furniture plus I liked that it had a paint + primer in one simple step. It also has durable adhesion and fast drying time built in for metal, wood, plastic, and other surfaces. I was able to cover the table with just one can and used the other two cans to re-paint the chairs. Wow what a difference a little paint can make. I didn’t realize how faded the sun had made the table and chairs but love the finished look of the re-painted table and chairs in this space. After painting I knew this space needed some fresh plants for that pop of color. Spring is all about beautiful flowers so I visited the garden department at my local Walmart to check out what flowers were available. I adore Walmart’s garden department as every year it is a place that my family likes to find plants for our garden areas from vegetables to gorgeous flowers and bulbs. I first looked for a hanging basket plant that I could put in the archway of our front porch sitting area. I found a unique plant called a Purple Wandering Jew ($9.98) that I knew would look great in this space. Since one of our garden’s accent colors is purple, I loved that the underside of the leaves of this plant are actually purple! Next, I went on to find some plants to fill some purple plastic planters that I held onto from last year. I, of course, couldn’t resist filling these pots with some of my favorites like pansies but I also wanted to mix up the arrangement a bit so I also added a purple Lantana ($3.84) to the center of each pot as well. I think pot gardening is an easy way to add a splash of color to a small space just don’t forget the potting soil. I planted our new plants with Hyponex by Scotts Potting Soil which is only $3 per bag at Walmart. Before tackling our larger gardens I always love to fill our outdoor living spaces with several pots of fresh flowers. 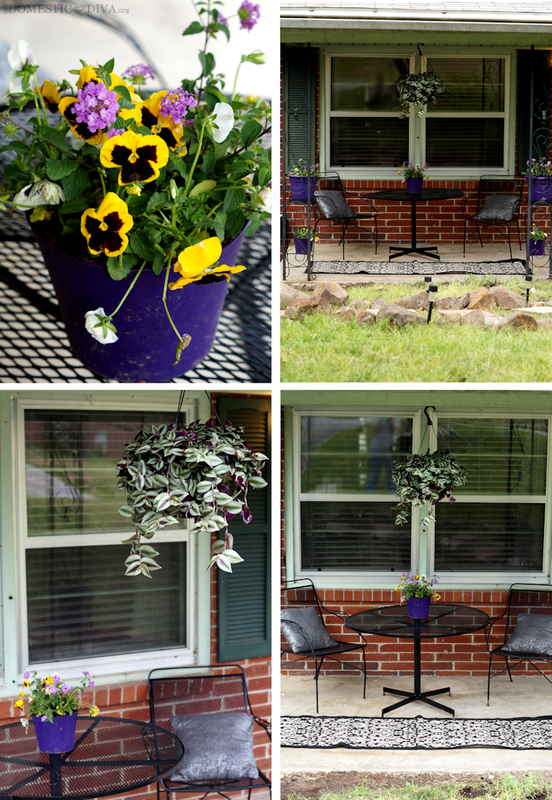 So with a little paint, fresh flowers, and re-purposed items from our around our home I was able to turn our drab front porch into a welcoming space with help from Walmart. I love this space now and can definitely see myself sipping a cuppa tea on the front porch and relaxing on a spring afternoon. What is on your outdoor project to-do list? Disclosure: As a participant in the Walmart Moms Program, I've been compensation for my time and efforts in creating this post. All thoughts and opinions are my own. My experience may differ from your own.